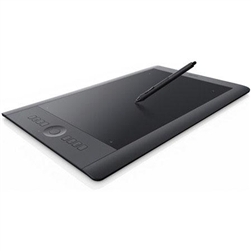 The Wacom PTH851 Intuos Pro Pen and Touch Tablet (Large) is designed to accommodate artistic styles that require a full range of motion and for creative professionals who work in large formats. Many users will also be able to utilize the large form factor when working on multiple displays. With precision and control, you'll be able to take full advantage of your professional software. The Intuos Professional Pen and Touch tablet has 2048 levels of pen pressure sensitivity on the pen tip and the eraser. You can edit your creative work with the accuracy and precision of traditional brushes and pens. Designed for both right and left-handed use, you can also enjoy the freedom of working unattached from your computer by using the Wacom wireless kit included with your tablet.